Let’s talk prunes. Why is it they have, sadly, a direct connection with elderly constipation? At 27, I can’t answer this question. Do you stop having regular bowel movements after the age of 65? Should I be worried of this inevitability? I want to defunct and rejuvenate the prunes reputation. 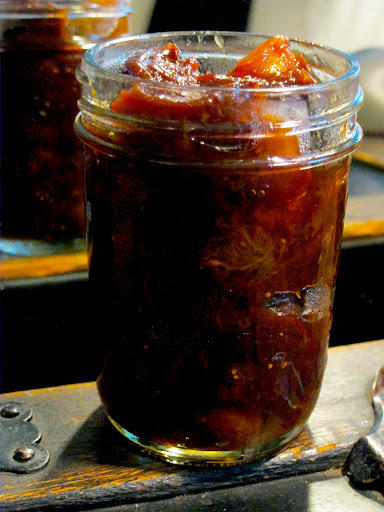 The dried plum is no different than any other dehydrated fruit and deserves respect. 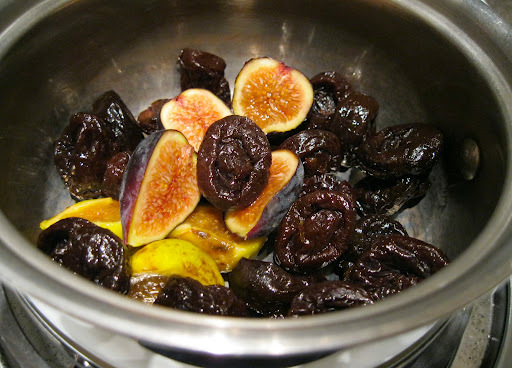 Prunes are high in vitamin K, fiber, B6 and Potassium, which aids the cardiovascular system. They boast soluble fiber which helps to regulate blood sugar and are high in antioxidants. The nutritional stuff aside, they taste delicious. I visited London for a week in my early twenties and stayed at this cute bed and breakfast. Every morning we’d come downstairs for a traditional English start. We were greeted with a small dish of cooked prunes, swimming in thick syrup. 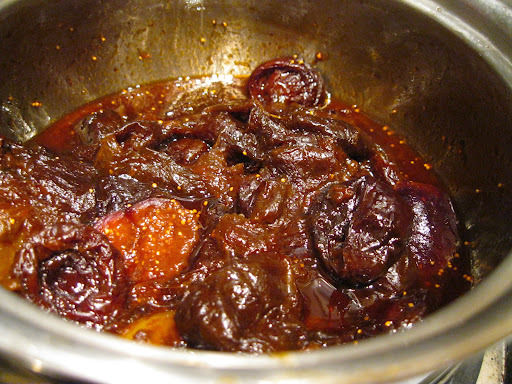 This occurs naturally when dried plums are simmered in water on the stove. They reconstitute, becoming plump and thick again, but now with a concentrated sweetness. Have a few for breakfast along side your toast and eggs, strong coffee and milk. It’s simple yet grounding. Prunes are crotchety no more. 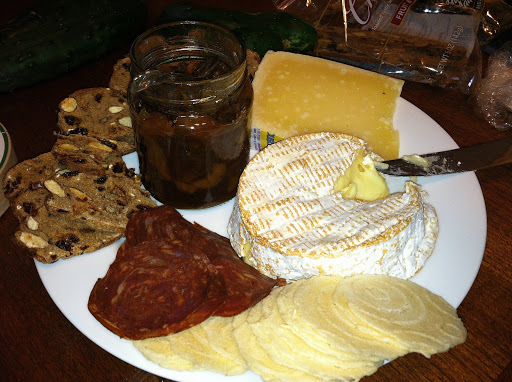 They have entered 2012 with an air of sexiness, cooked with figs or sweet wine, and seen topping vanilla gelato or accompanying a cheese board. Let the constipated eat prunes for regularity, I’ll nosh on them for sensual pleasure. In fact, I’ll take two. Foodie note: You really can’t ruin this so don’t get caught up on the recipe. Put prunes (and anything else you think sounds good) in a small sauce pan with water and simmer until plump. Done. Put all ingredients into a sauce pan, bring to a boil, drop temperature to medium-low and simmer for 30 minutes. Liquid should be thick and syrupy. Cool, store in a glass jar and keep in the refrigerator for up to three weeks. I made a second batch last week and added a tea bag of chai spice. Brew it for 10 minutes while the prunes cook then discard. Cook prunes the remaining time, cool and serve alongside ripe Camembert and Anjou Bakery crostini.